Storytime Norms: Now with picture clues! I have learned so much about group management from the preschool teachers I work with. I know the right words to use with preschoolers, and I always try to phrase things in a way that is less negative (“don’t do that!”) and more positive (“I need you to stop”). One of the best things I’ve seen, though, are the little picture cards they use to reinforce behaviors. 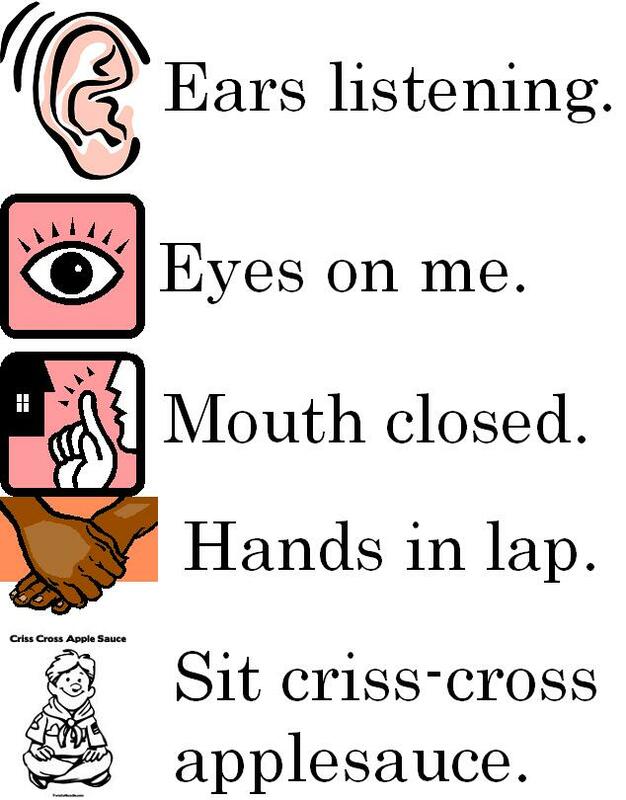 These are frequently used with children on the Autism Spectrum, but work with any child who needs a little reminder of the task at hand. It’s also extremely handy when you’ve got non-english speaking kids in the group and you’re not able to communicate effectively with them. A picture really IS worth a thousand words! This year I decided to make my own list of storytime “rules” along with their visual cues. I will carry it with me to all storytimes, and will go over it with the kids during our first storytime of the year. After that, if I need to remind someone that they need to be listening, I can just point to the picture. I will have the list nearby, posted, so folks can see it at all times. Based on the storytimes I had today (first time I used the picture cues), trust me, it works! Here’s the document I created. Our graphics department laminated it, and the back side is in Spanish. Here’s a link to the PDF version if you’d like to print and use it. Page 2 of this document is the Spanish version. Mary, what an awesome way to let children know what to expect and what is expected of them! Being in a library setting, often kids come to storytime who have never had group learning experiences and this is a really effective tool! I’m going to use it!